Tahn Pra Kru WiRiYahTiGahRee (Nahk) from Wat Hua Hin or Wat MaKaReuTaaiWan, had never chanted any amulets before except a single batch of amulets which was created by the 5th Thai King Pra Baht Somdej Pra MongKutGowJowYooHua. 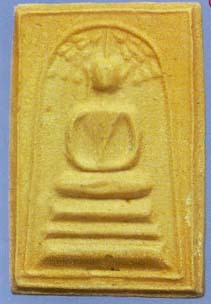 The King appointed Luang Poo Nahk to be the Pratahn (chairman) during the chanting ceremony which also invited many famous monks to chant this batch of amulet. This batch of somdej was therefore called Pra Somdej Wat MaKaReuTaaiWan. Luang Poo Nahk Wat Hua Hin was a monk who possessed alot of Wichah(magical chants). His famous Pra Yan and Dtagru are well known to be able to stop wind from blowing and rain from falling. When one encounters rough sea and strong wind at sea, one can use Luang Poo Nahk Pra Yan and Dtagru for protection and safety. Pra Somdej Wat MaKaReuTaaiWan was mixed with many types of oil. This somdej has 2 types of colours; Yellowish Brown and Light Brown. There are many different pims in this batch. The more common pim is Pim Prok Poh. This Pim Prok Poh is very similiar to the design and shape of Somdej Pim Prok Poh from Wat Rakang. This batch of somdej is rare and very popular. It is good for Metta MahaNiyom, Kong GraPan SahTee, protection of evil spirits and black magic. The price a Somdej Wat MaKaReuTaaiWan is about 10,000 bahts or more.